There are times when medical attention from a professional is needed immediately. If there is an injury leading to a puncture wound in the eye or throat do not attempt to remove the object. Try to keep the person calm to avoid excessive bleeding. Call 911 if bleeding does occur for more than 10 minutes after applying pressure, if the wound is to the chest or abdomen, or if the person is having trouble breathing. Also call 911 if the person is dizzy, vomiting, or unconscious. If the puncture wound does not appear to be life threatening, stay calm, but still get to a doctor as soon as possible. Dirty wounds, animal or human bites, non-emergent puncture wounds to the neck, chest or abdomen, and injury through the bottom of a shoe, such as a rusty nail, should all be seen by a physician. If the object is easily removable then you should attempt to do so. Apply firm pressure around the outside perimeter and quickly pull out the object at the same angle which it went in. after the object has been removed continue to apply firm pressure to keep the wound from bleeding until you can get to a doctor for further review. Keep the wound clean by rinsing it with cool water for several minutes. This will help free the injury site of any dirt or debris that has entered the wound. An antibiotic cream can be applied to kill any bacteria that has entered to wound. A silicone based gel can also be applied to help prevent scarring. 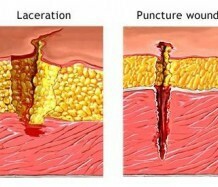 Next you want to cover the wound with a bandage to prevent outside toxins from entering which could cause infection. For mild pain, take an over the counter medicine such as ibuprofen or acetaminophen. For more severe pain, or if the wound begins to ooze pus consult a physician because this may be a sign of infection. Most minor wounds can be treated and cared for on site. If it is more severe or starts to show signs of infection such as swelling, bleeding, or itching then you should call your doctor. He or she may be able to prescribe antibiotics or give a tetanus shot to help speed up the healing process. They may also be able to refer you to a dermatologist who can discuss options with you on preventing scarring. Once the wound is healed you will most likely be left with an interesting story and an even more interesting scar. Most people would prefer to cover up the scar though. Covering up the scar can be done with clothing and concealers, but this can become a hassle especially if the scar is on the arms or face. There are many ways to help shrink and fade the scar. Some of the more common remedies may include silicone gels and pressure dressings. There are also more extreme cures that include microdermabrasion or even surgery.